Here we look at these historical parallel developments. iSYSTEM opens an office in Novi, Michigan. With many customers involved in developing the safety-critical electronics for the automotive industry, a presence in the Motor City is now provided by our Detroit team. iSYSTEM launches their next-generation BlueBox hardware – the iC5700. Featuring a gigabit internal bus, known as FNET, the BlueBox platform can now support various data capture interfaces (such as CAN, CANFD, LIN, digital and analog), splicing this information into the available program and data trace provided by the target microcontroller. In addition, new “Active Probes” support the full data rate of the Infineon AURIX Dual-DAP debug interface as well as the ARM® defined HSSTP. ARM announces the Cortex-M23 and Cortex-M33(F), the Cortex-R8(F) and Cortex-R52(F), as well as the Cortex-A73 and Cortex-A32. iSYSTEM celebrates its 30th anniversary. ASYST d.o.o. renames itself iSYSTEM Labs d.o.o. in recognition of the close working partnership the two firms have. ASYST d.o.o. invests in pick-and-place machinery and wave soldering tooling, enabling the team to manufacture all BlueBox hardware and accessories in-house for the first time. With the industries growing interest in powerful 32-bit microcontrollers, with their increasing memory addressing capability and performance, a new BlueBox is required with an updated internal architecture that can handle the trace-data speeds and provide enough buffering and bandwidth to the host development PC. The iC5500 is launched featuring a 1GB SRAM buffer and a USB 3.0 interface to support those needs. As its predecessor, the tool can also be expanded to capture or control digital and analog signals with the IOM-5 Input/Output Module accessory. Especially in the area of automotive, complex, multi-core and high-performance microcontrollers are increasingly finding their way into safety critical applications. In order to deliver the insights required for developing and testing such applications, the iC6000 is launched. With its USB 3.0 interface to the development PC and 8GB of internal SRAM for buffering trace data, it is ideally suited to products from Infineon (TriCore) and ST Microelectronics and NXP (Power Architecture). The inclusion of an AURORA GBit interface allows the tool to support serial-trace clocks of up to 6.25GHz. ARM announces the Cortex-R4(F), Cortex-R5(F) and Cortex-R7(F). With the interface to a microcontroller’s debug interface opened up by isystem.connect, the question raises itself – “Could we test software on the target via the debug tool?” With this, testIDEA, a software tool for creating unit tests, is born. Via its intuitive user interface and clever, time-saving features, embedded software engineers are finding bugs and errors in code before it ever gets to the integration stage. As the cost per transistor continues to drop, the microcontroller industry is moving away from emulation devices and standardizing on various on-chip debug modules, interfacing via serial interfaces such as JTAG. With embedded systems becoming more complex, iSYSTEM decides to revamp its debug hardware platform with the introduction of the iC5000 – a true multi-architecture embedded systems development tool. Rather than needing to purchase different hardware to support different microcontrollers, a simple software license can be purchased, enabling fast and easy immediate support for new products. 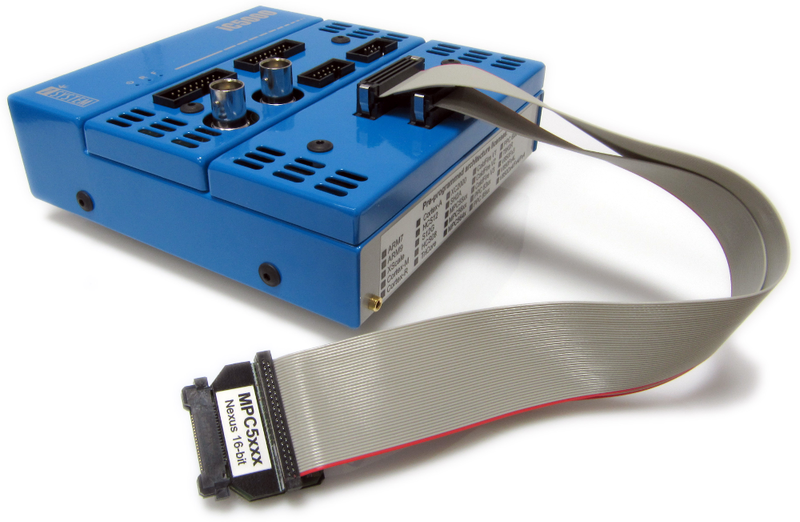 The iC5000 can also be expanded with an IOM-2 Input/Output Module. Combined with winIDEA, digital and analog signals can be displayed in parallel to trace data, or, together with the isystem.connect SDK, a signal can be output or evaluated as part of a simple hardware-in-the-loop (HIL) system testing platform. Due to increasing demand for access to the debug interface via iSYSTEM’s BlueBox technology, the team develops a software development kit (SDK) providing access to the same base functionality that winIDEA has been using to debug, trace and profile code on microcontrollers. The SDK, named isystem.connect, provides APIs that support various languages, such as Python, Java and C++, to name a few. iSYSTEM celebrates its 20th anniversary. Infineon launches its first generation AUDO processor with a 32-bit unified RISC/MCU/DSP microcontroller core named TriCore. The strategy of modular embedded development hardware having proven itself, and with PC interfaces and operating systems fairly standardized, iSYSTEM roles out a new platform – the iC3000. Featuring both USB and Ethernet interfaces, the iC3000HS can accommodate a range of on-chip debugging interfaces, from JTAG/NEXUS to proprietary, via a PCMCIA-format exchangeable iCARD. For devices still offering old-school emulation, the iC3000GT offers advanced trace features via the iTRACE PRO and iTRACE GT in addition to standard debugging support. iSYSTEM celebrates its 10th anniversary. With the move to windowing operating systems, such as Microsoft’s Windows 95, iSYSTEM also moved with the times, releasing winIDEA. Building upon a well thought through user interface focused on bringing the most used control elements to the forefront, winIDEA continues to move from strength to strength. With a willingness to change and swap between semiconductors vendors and processor architectures amongst customers, the cost of tool investment when changing had started to become an issue. iSYSTEM’s development team started again from scratch to develop a platform that could support everything from 8-bit to 32-bit processing architectures, with only small changes in hardware necessary to support alternative, or even completely new, microcontroller devices. 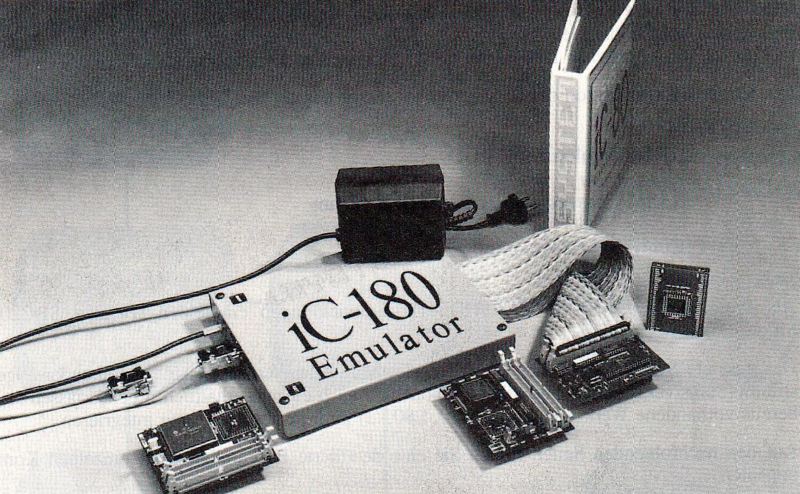 Thus, the iC2000 was born – a stackable, modular platform that is more in line with today’s modern BlueBox architecture. The solution offered a RAM/ROM simulator, processor emulation modules and a “PowerTrace” to support performance analysis and code coverage. As such, the core features of all future iSYSTEM embedded development hardware were put into place. The iC166 In-Circuit Emulator for Siemen’s 80C166 microcontrollers is launched. Various adapter PODs are available to support the various device packages on offer. 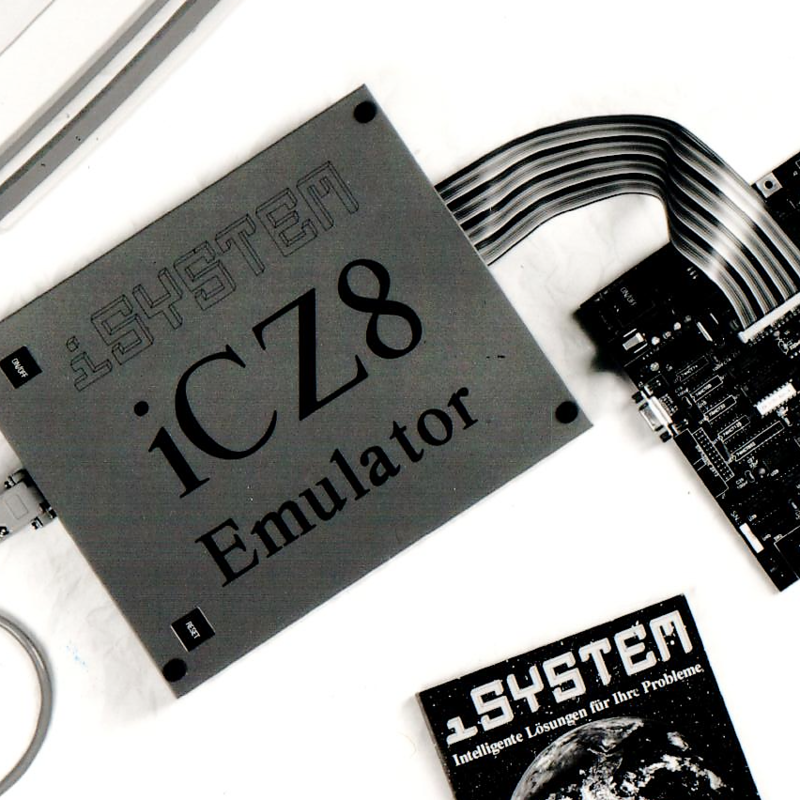 The Z80 emulator offering is expanded with the introduction of the iC181 In-Circuit Emulator. The programmer product line adds the SEPROG, a low-cost EEPROM programmer supporting a range of E(E)PROMs, PLDs, and flash-based microcontrollers. The simulator product line also adds a low-cost ROM simulator, the ESIM, that supports a good cross-section of common EPROMS. Siemens (today Infineon) launch their C166 family of 16-bit RISC microcontrollers with extensions for bit-addressable memory and low-latency interrupt system, targeted to replace Intel’s established 8051 controllers. iSYSTEM’s first windowing integrated development environment is made available in the form of dosIDEA. Many of the basic concepts required for debugging and performing trace with emulators still exist today in winIDEA. 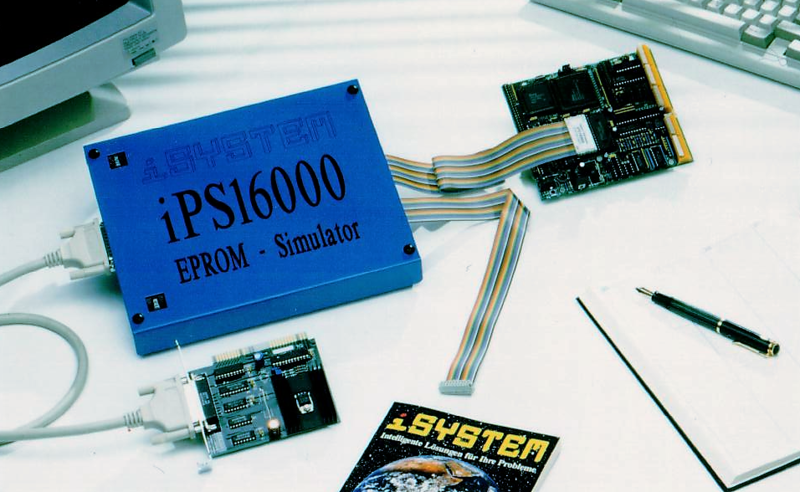 The iPS16000 ROM/RAM Simulator is launched. This new memory simulator supported memory sizes of up to 16MBit and access times as low as 70ns were guaranteed. A chance meeting between Helmut Kindermann and Iztok Hudoklin from Yugoslavia (today Slovenia) marks the beginning of a business relationship that continues today. Istok’s company, ASYST d.o.o., takes over responsibility for software and hardware development, whilst iSYSTEM concentrates on customer support and sales. Programmable logic devices, in the form of PLDs, PALs, GALs, FPLs and other variants, needed programming in addition to E(E)PROMs. 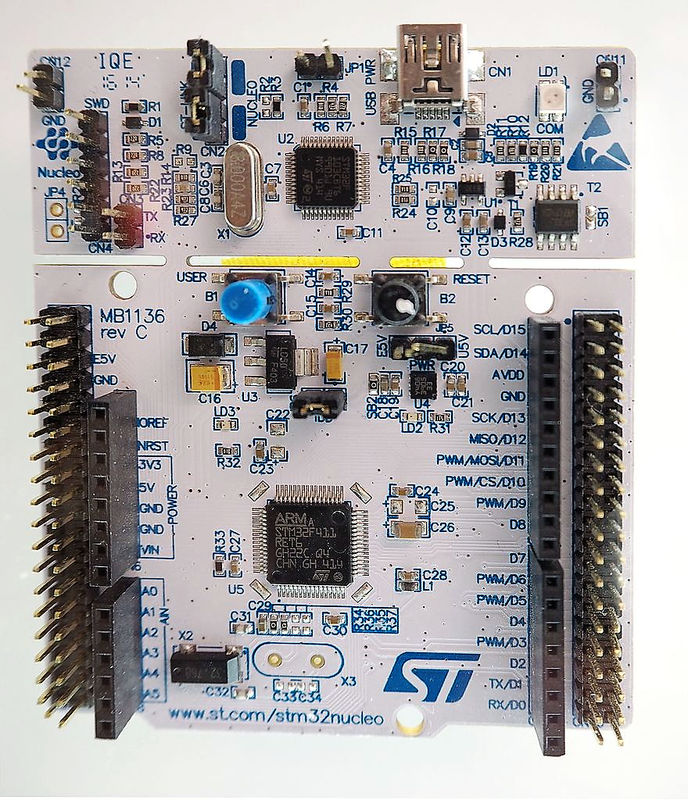 iSYSTEM launches the iUP8000 Universal Programming System that functions independently of the silicon manufacturers PLD design software and also programs E(E)PROMs. The iCZ8 In-Circuit Emulator from iSYSTEM is launched. 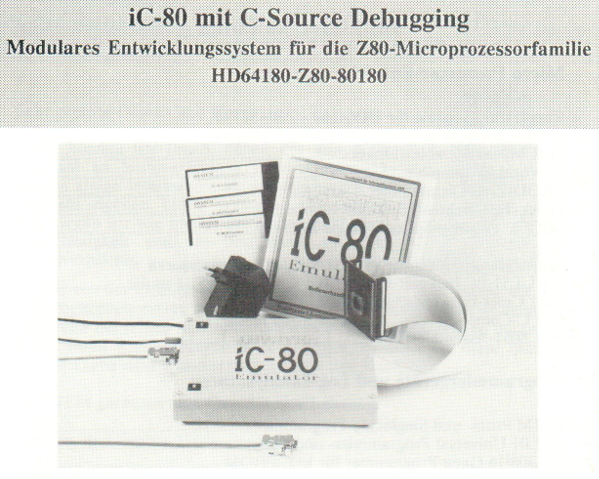 Based upon a special bond-out device (Z86C12) the device was capable of emulating over 20 different device variants. The development PC software was designed to work both with keyboard control and a mouse, included pull-down menus and supported color displays. iSYSTEM’s first software product, the iSIM-Simulator, provides a simulated environment for code targeted at Motorola’s 6805 devices and their derivatives. Also launched is the iC680 In-Circuit Emulator, targeted at the 6809 family of Motorola microprocessors. It delivers real-time emulation at up to 8MHz, 64Kbytes of emulation memory and supports 20 intelligent breakpoints. A DOS-based windowing interface delivers the insights embedded developers need for their projects. IBM launches the RS/6000 computer, the first to make use of the Power Architecture®. The Power Architecture® is later licensed for various microcontrollers used in the automotive industry, such as the Freescale MPC5000, PowerQUICC and QorIQ devices and ST’s SPC5 family. iSYSTEM adds further 3rd party tools required for debugging and developing embedded systems with V3 Corporation’s PC/LA-32 Logic Analyser, featuring 32 channels and using the host PC for displaying results, and Tango’s PCB and Router design software.Later in the year, in-circuit emulators (ICE) are added for the 68HC11 and 80x86 families, including the Intel 80386. 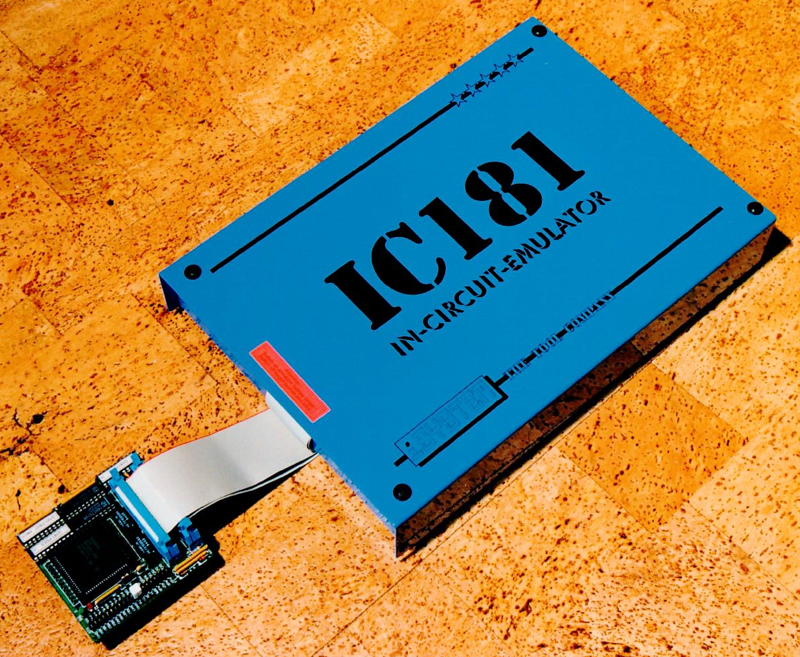 The next ICE to be launched is the iC-180 In-Circuit Emulator, targeted at Z80 processors and its derivatives. The device receives a significant performance boost when coupled with the D64180 real-time coprocessor for PC/XT/AT/386 developer’s machines. Debugging was, however, still limited to command-line DOS software. iSYSTEM launches its iPS4000 EPROM Simulator. Erasing PROM memory often required an ultra-violet (UV) light box, slowing down how fast new code could be tested on a target embedded system. EPROM simulators used SRAM to simulate EPROM, plugging into the socket of the EPROM memory on the target circuit board. The first in-circuit emulator (ICE) from iSYSTEM is launched in the form of the iC-80 In-Circuit Emulator, designed for Z80 microprocessors (including the HD64180 and 80180). Linked to the development PC via an RS-232 connection, the hardware emulated up to 64KBytes of memory, supported the 1MB address range of the HD64180 and provided eight digital outputs to support performance analysis in conjunction with a logic-analyzer. This was also the first product to feature a BlueBox™ cover! Also new this year was the EP1MB – Universal EPROM Programmer. Covering programming voltages from 12.0V to 25.0V, the device could automatically apply a fast programming algorithm for devices that supported it, programming at up to 1msec per byte of data. 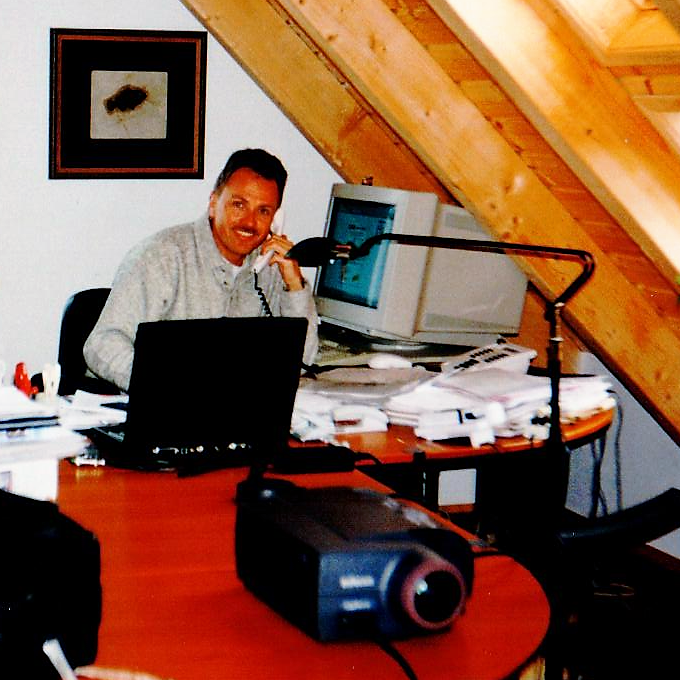 Helmut Kindermann founds “iSYSTEM Gesellschaft für Informatiksysteme mbH” based in Dachau, Germany. Located just to the west of Munich, Bavaria, which had moved from an agrarian state to one of Germany’s leading industry centers during the 60’s and 70’s, there were plenty of business opportunities on the company’s doorstep. The company starts as a distributor of hardware and software for embedded software developers. Included in the company’s portfolio are cross-compilers for the 8051; EPROM programmers; PC/XT/AT emulators for the 8031/51; real-time co-processors based upon the Hitachi HD64180; and a Z80 simulator. Hitachi develops a Z80-based processor with an integrated memory management unit (MMU) named HD65180, later known as the “Super Z80” that was later licensed to Zilog. Motorola launches the 68HC11, an 8-bit microcontroller that finds a home in automotive applications, barcode readers and other embedded systems. Intel’s 80386, a 32-bit processor based on the x86 architecture, is launched. It can correctly execute most code intended for its 8086 and 80286 predecessors. 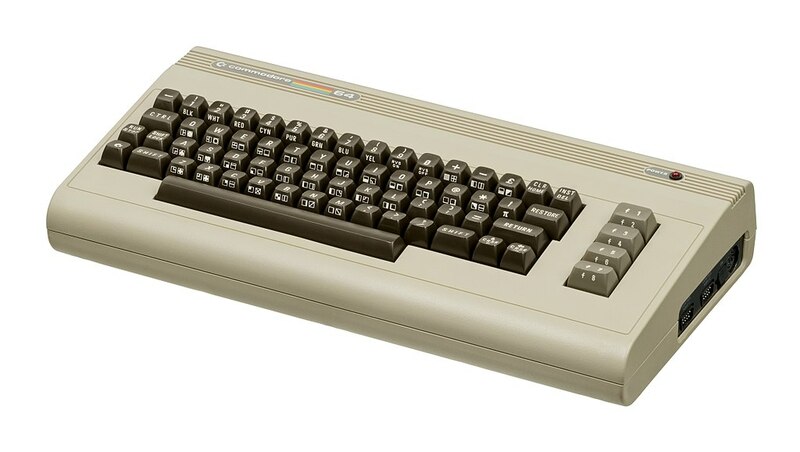 Commodore Business Machines launch the Commodore 64, also known as the C64, the highest-selling single computer of all time. With a 16-bit external data bus multiplexed with a 20-bit address bus, Intel launches the 80186. The 80188, with an 8-bit data bus was also released in the same year. The non-multiplexed 80286 was also launched as an upgrade to 8088-based PCs. Developed for embedded systems, Intel’s MCS-51, better known as the 8051, is launched in NMOS technology. Intel’s Haifa laboratory in Israel design the 8088, based upon the 8086 but with a shortened prefetch queue and an 8-bit, instead of 16-bit, data path. After almost two years of development, Intel launches the 8086, a 16-bit microprocessor that became the core of the IBM PC XT and launched the x86 family upon which today’s PC industry is built. Terry Ritter and Joel Boney introduce the 6809 at Motorola, an 8-bit microprocessor with some 16-bit features. The device becomes the core for the Dragon and TRS-80 home computers. Zilog launches the Z8 microcontroller featuring a 64KByte ROM or flash memory address space, 4,096 fast on-chip registers (for use as accumulators, pointer or ordinary RAM) and a host of typical MCU peripherals, such as A/D converters, serial interfaces and IrDA encoder/decoders. 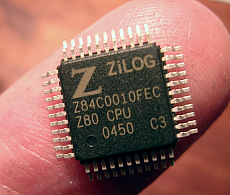 First working samples of Zilog’s Z80 microprocessor are delivered by Federico Faggin and his team. Designed by Chuck Peddle’s team for MOS Technology, the 6502 processor was the least expensive, fully-featured microprocessor on the market at introduction. 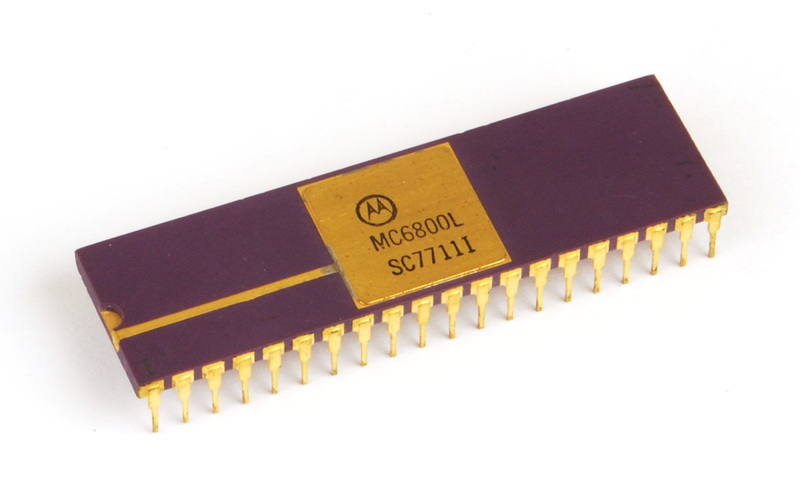 The MC6800 was introduced by Motorola and was the only family of integrated circuits (ICs) that could operate from a single 5V power supply, with alternative microprocessors requiring three voltages.